Today is the day that the 291 and 178 buses go double decker. It’s a welcome boost to those who use Queen Elizabeth Hospital as both routes pass the site. But how have you found it on the first day? Many were sceptical that the 291 in particular, could work though narrow streets. It wasn’t so much that buses could get by if roads were clear, but if poor parking halted progress. Initial trials of the route failed, but since then another passed and some double yellow lines have been installed in places. 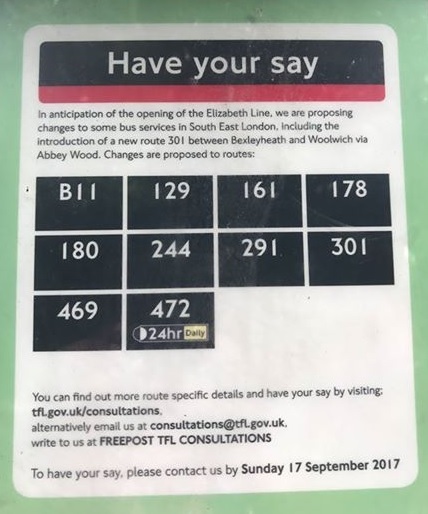 The delay until late 2019 has seen that plan halted for now, as well as the 472 extending to Abbey Wood and the B11 being cut back. If you’ve used the new 291 leave a comment about how smoothly it’s operating. Took a ride to the Woodlands estate. Driver very good. Left turns a bit tight but managed. Poorly parked van on a bend was the worst part but OK. I saw a 178 in Lewisham where I live but as it’s not a bus I normally take, would not have registered its conversion to double-decker if I hadn’t read about it here. Took the westbound 291 later afternoon and it was a good journey. The turning from Raglan Road into Burrage Road (which I was sceptical about) was no different to when it was a single decker. Think the new capacity will really help the peak period usage as the buses are often so full they often miss stops. Times have gone completely out of the window on the 291 route. A new trick some drivers are doing is terminating at the coop and not going around the woodlands estate loop at all. When quizzed by passengers being kicked off at the coop the drivers response is we need to get our time back kind of answer. As was predicted the buses are getting held up at pinch points.